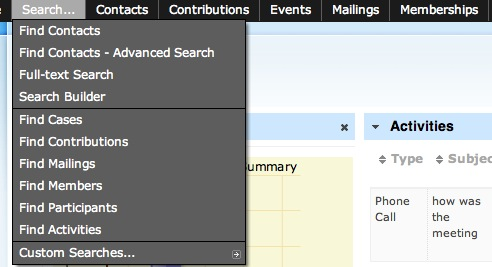 The navigation menu is a small bar at the top of every "back office" page of jManage. It provides access to nearly every function of jManage and is broadly organized into headings by individual components (such as Contributions, Events and Mailings), with a few exceptions for Search and Administer, both of which cover all of the enabled jManage Components. You can modify the navigation menu by going to: Administer > Customize > Navigation Menu and then adding or rearranging menu items on the screen. Remember that changes you make to the navigation menu will be seen by everyone who has the appropriate permissions to see the menu, for better or for worse, so be careful when modifying the navigation menu.